With the demise of Master Replicas (It was bought by Corgi and then faded into the sunset), EFX has taken up the banner of high end replica props. Barry and Bryan, the two founders are industry vets, and EFX has secured a number of licenses, Star Wars, Disney, and Star Trek. 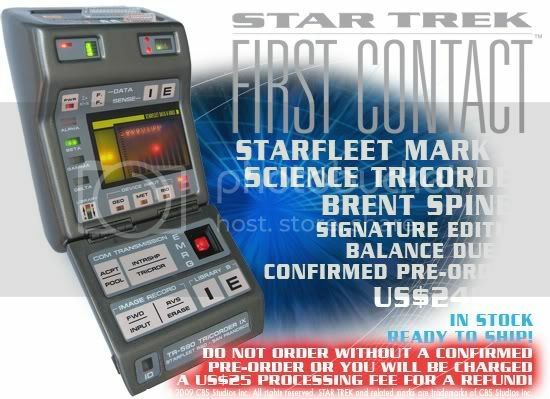 An avid Star Trek Prop, Costume & Auction Blog reader recently wrote a review of the new TNG era Mark IX Tricorder which I am happy to print, as EFX items are top quality, and worthy additions to a prop collectors collection. The Mark 1X Tricorder, as sold on the Entertainment Earth web site,. is a copy of the tricorder used by LT. Cmdr. Data in Star Trek First Contact. The casing of the tricorder is cast metal with a plastic battery door that attaches to the tricorder with four screws - the same as the original prop. The tricorder comes with all of the bells and whistles you would normally get in a high quality replica including a prop stand and a numbered plaque. It is loaded with LEDs and has the original science tricorder scanning sound - all of which engage when the tricorder trip switch is thrown by opening the door/flap of the tricorder. The only sound issue that I see is with the opening of the tricorder. The ratchet sound is a fabricated electronically rather than having it built into the door itself. This slightly takes away from the overall aesthetic affect of the prop. Being made out of metal, the tricorder is very heavy, perhaps too much so for any real prop enthusiast to enjoy playing with because you feel like you're going to drop it when you pick it up and you wonder whether it will fall off the custom stand. But rest assured, it is very secure. If you already own the Master Replicas First Contact Phaser, then this is a good sister prop to add to your collection because both are made out of metal and both display similarly on their custom stands. Overall, it's worth the $349.00 U.S. (compared to the $249 that EFX Collectibles had it posted on their web site for) that Entertainment Earth charges considering the Roddenberry.com props go for more than double this and when you add in that this is limited to 684 pieces and comes with Brent Spiner's signature, you can't go wrong. I don't doubt that these units will triple in price on Ebay within six months of initial delivery so if you have the $349.00 to spend, get it now. Many of you know I am good friends with Dana Hammontree, who just recently started a prop business with Wes Cannon, another well known prop collector. Their company is Hollywood History and you should check it out regularly if you are a Star Trek fan. I recently bought a set of Tellarite pistols from them and I give Dana high marks for his service. Dana is as connected as any dealer in the Star Trek prop and costume market (I met Dana waiting in line to get into the Christie's Star Trek auction in 2006) and so he tends to have good Star Trek items for sale. 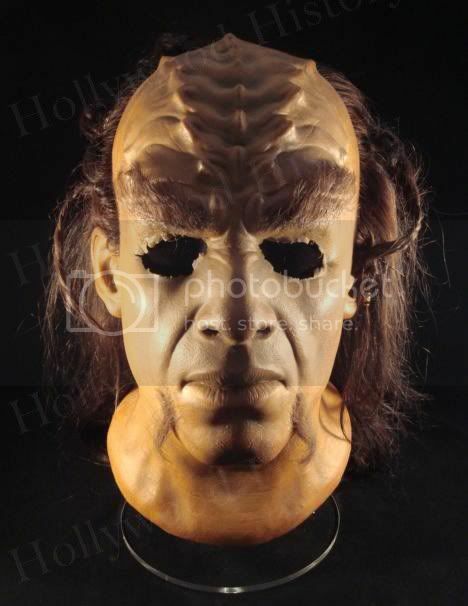 One such item is a Klingon Mask from Star Trek VI he just listed. If you don't have one of these, I highly suggest getting this. It is listed at only $ 899. I think that is a great price for a real mask used on Star Trek and it comes with an IAW COA, so you know it is the real thing. Tom Spina is a prop restorer, and one of the best in the business. I first met Tom at the Christie's Star Trek auction and have done business with him and chat with him whenever Star Trek is the topic he needs a "fix" of. 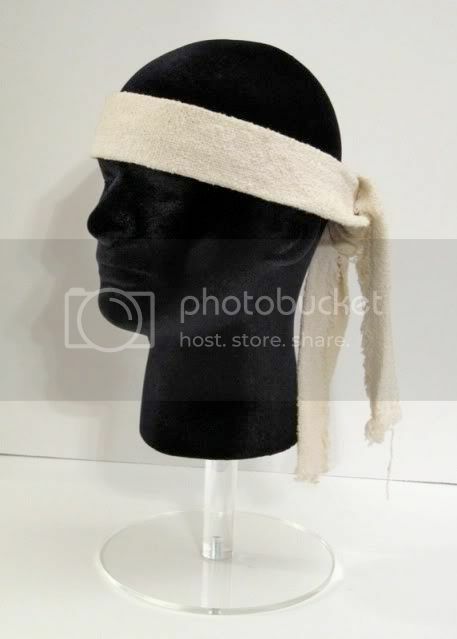 An original Spock headband from The Voyage Home - $1999 shipped (or best offer) in the US. Comes with shown display stand and a COA from It's a Wrap who got the item directly from Paramount. 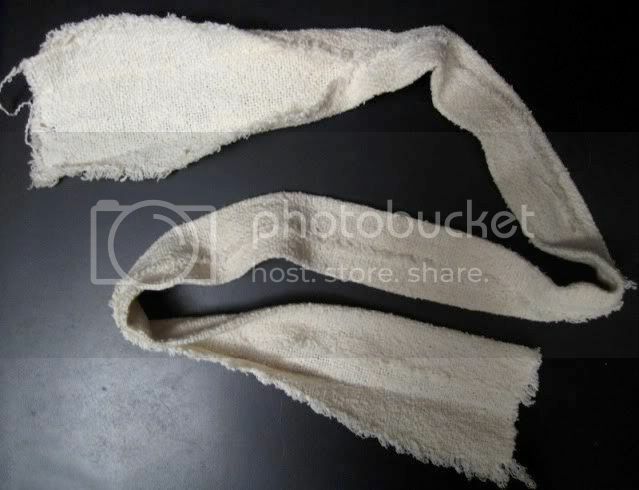 The second pic shows the inside of the headband - the folds are stitched closed through the center of the piece but the ends are not so they "flare out" as shown. email Tomspina@mac.com with any offers and thanks! Star Trek Prop, Costume & Auction Forum hits 1,000! Well, the Star Trek Prop, Costume & Auction Forum has passed 1,000 members! In just over 3 years, the forum has become the # 1 place to chat about screen-used Star Trek props & costumes. I have made a lot of great friends over the past three years, and the Forum now holds gatherings every year at the Star Trek Las Vegas convention. The Forum is more than just an online place to chat, but a great source of knowledge and information as most of the biggest Star Trek collectors around belong there. We want to thank everyone who has made the site such a great place to talk Trek and one of the most civil forums on the Internet.